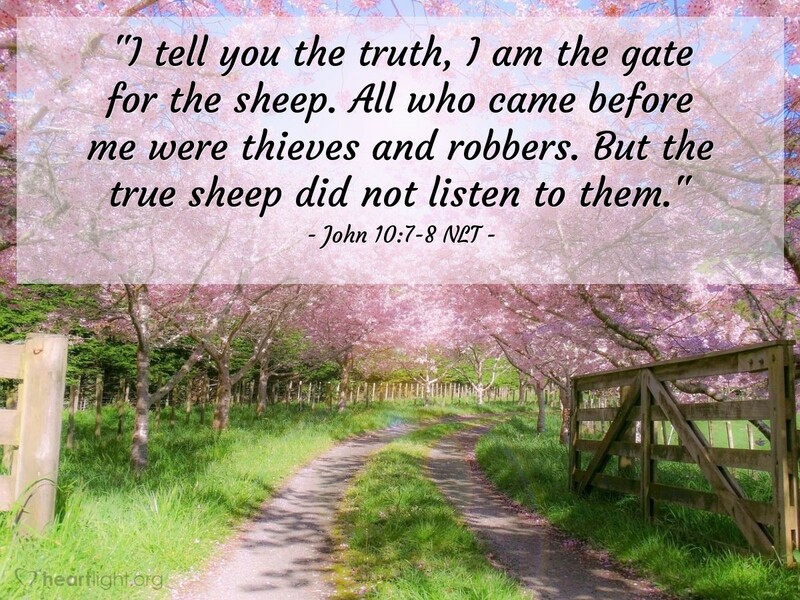 [Jesus explained his statements about sheep following only their own shepherd:] "I tell you the truth, I am the gate for the sheep. All who came before me were thieves and robbers. But the true sheep did not listen to them." People were constantly looking for a messiah, and many false messiahs had come and gone. Many religious leaders were ready to claim that role. But only one was sent by God. Only one did the will of God completely. Only one was willing to lay down his life for the sheep of God. This kind of shepherd not only entered through the gate but in the open fields, he was willing to lay down his own body to be the gate in the make-shift pens to protect the sheep and to calm their restlessness and fears. Jesus was not seeking his own good or glory, but he came to serve God's sheep — including us. Why? He did it because that is what God wanted him to do and because that is what a real shepherd does! Lord God, help me not to listen to the false voices of self-appointed religious leaders who are unwilling to sacrifice for your sheep and instead want to fleece them for their own benefit. Thank you, Jesus, for being the one real shepherd that I can follow. By the authority of your name, I offer my prayer and praise. Amen.